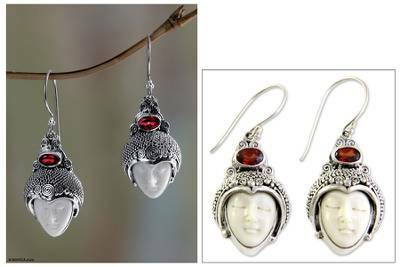 Sterling Silver and Garnet Dangle Earrings, "Royal Romance"
Buana carves the peaceful features of Balinese royalty from bone and dresses them in silver. Crowned by garnet, these exceptionally lovely earrings total 1 carat. You can find garnet dangle earrings 'Royal Romance' by Buana in jewelry categories such as Birthstone Earrings, Garnet Earrings, Bone Earrings, Silver Earrings, Sterling Silver Earrings and Dangle Earrings. Enjoy exploring these sections for other Novica treasures. I have two large artisan pendants with the same bone faces that I have been trying to find matching earrings for. Saw these by chance and as the gemstone matched stones in the pendants I ordered them. I LOVE THEM !! They are the perfect size, not large but very noticeable. Wore them with a pendant and had strangers stopping me and asking about my jewelry. Will definitely be ordering more of this line of jewelry. Great job artists ! These now match the ring and pendant I have, a stunning set . Beautiful workmanship. Thank you. Lyn. These earrings were bought to go with a similar pendant. They are simply stunning! This is the perfect complement to my Royal Heir sterling silver, bone and garnet pendant necklace. Beautiful earrings!